The Chief Minister, Capt Amarinder Singh, who was here today to preside over a meeting of advisory committee to review arrangements for quadricentennial celebrations of installation of Guru Granth Sahib, confirmed the participation of the President, Dr A.P.J. Abdul Kalam, and the Prime Minister, Dr Manmohan Singh, in the ceremony on September 1. Prof Eman-ul-Haq, one-man commission of UNESCO on an assessment visit to Golden Temple with regard to declaring it a world heritage site, would send the copy of ‘assessment report’ to the Chief Minister. Where does money Punjab gets from Centre go? A search has begun for big money — about Rs 1,500 crore — that has given Punjab under various Centrally sponsored schemes and projects or institutionally funded projects that went missing, probably diverted with impunity towards meeting the state’s committed expenditure — pay, pension, interest repayment. Why not plan out and implement reforms on this I-Day? While landless labourers, workers and other poor sections of society have tried hard to break themselves free from the age-old poverty in villages like Doomcheri, Ballan, Kajauli etc, near here, what has been hurting them most is the Punjab Government’s “ non-caring “ attitude towards them. The state government has failed to act on the Army advice for taking measures to prevent damage to the fencing on the Indo-Pak border. Showing utter disregard to human life, a PCR cop of the Phagwara police allegedly kicked an accident victim several times in his chest besides abusing him instead of arranging medical care for him near Capital Bank, on National Highway No 1, Phagwara, late last night. 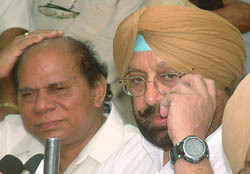 Mr Mohinder Singh, an employee of the Indian Railways, has been repenting the moment when he wrote to the higher railway authorities and other agencies of the Central Government, about more than two years ago, regarding corrupt practices being followed in a section of the divisional office of the Indian Railways here. Mr Jeet Mohinder Singh Sidhu, local MLA, who defeated Congress candidate Harminder Singh Jassi and SAD nominee Mohan Singh Bangi, by contesting as SAD rebel candidate in the last assembly elections from this seat, is likely to join the Congress tomorrow at Chandigarh. President of the Punjab Pradesh Congress Committee (PPCC) H.S. Hanspal said that the state unit was not in favour of aligning with the CPM for the forthcoming byelections in three Assembly constituencies in the state. Punjab Pradesh Congress Committee chief H.S. Hanspal talks to mediapersons in Jalandhar on Wednesday. — A Tribune photograph. The khula darbar being organised by Prime Minister Manmohan Singh can go a long way in solving the problems of those who had suffered at the hands of bureaucrats. This was stated by Mr Balwant Singh Kherra, chairman of the Malta Boat Tragedy Probe Mission, while talking to mediapersons here this evening. The Rashtriya Raksha Dal (RRD), the Defence Services Officers Association (DSOA) and the Amritsar Welfare Society today paid homage to Major Baljit Singh Randhawa of Rajput battalion who sacrificed his life while capturing formidable hill “Crooked Finger” in the Kargil sector on May 17, 1965. Major Randhawa was decorated with Maha Vir Chakra posthumously. A classic case of mistaken identity cost a Punjab police employee Rs 4,000. The local branch of the State Bank of India (SBI) gave his ATM card to another person having a similar name who withdrew the amount from his account. Though the police has registered a case of fraud, nobody has been arrested in this connection. Mrs Jaswant Kaur, who earned name and fame as an avid blood donor and social activist, has been presented with a state award by the Punjab Government for the current year. Punjab Chief Minister Capt Amarinder Singh gave her the award on Independence Day function at Hoshiarpur. Even as a clash among the farmers and the traders, who held separate rallies against each other here, was averted by the local administration by handling the situation tactfully, a large number of commercial establishments, including tea kiosks, remained closed in support of the traders. The Congress activists led by Punjab Youth Congress general secretary Vijay Inder Singla today flagged off trucks to Delhi, for the distribution of foodgrains to the flood-affected areas in the country. Nearly 10 persons were injured when a Chandigarh-bound PRTC bus overturned near Ghabdan village on the Sangrur-Patiala road, 8 km from here, today. An activist of a non-government organisation (NGO) Mr Balwinder Singh Bittu found a bag which contained Rs 50,000. He returned the amount to the owner. The Punjab unit of the Indian Medical Association (IMA) appealed the state government to scrap NRI quota in all three medical colleges of the state. The Sikh Nation Organisation has fixed a meeting with Akal Takht Jathedar Joginder Singh Vedanti for tomorrow to discuss Sikh issues and the ban on turban and religious symbols in schools of France. The Forum for Common Cause today appealed to the Union Law Minister and the National Human Rights Commission that the procedure of executing offenders by hanging should be replaced with administering intravenous lethal injection. The Punjab and Haryana High Court today asked the Punjab Government to file reply by Friday to an application moved by one of the petitioners in the ongoing case concerning alleged irregularities in the selection of Deputy Superintendents of Police (DSPs) by the Punjab Government under sports quota. Three brothers Satnam Singh, Gurwinder Singh and Rajinder Singh residents here have been sentenced to life for the murder of Sanjiv Kumar of Mehli Gate here, it was learnt here yesterday. 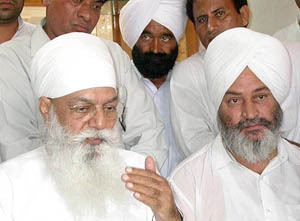 District and Sessions Judge Kapurthala Sham Sunder Gupta awarded the sentence and fined them Rs 2000 each. On a call given by state the working committee, a large number of farmers, led by the Jamhoori Kisan Sabha, held a protest rally against the anti-farmer policies of the state government at Company Garden here today. Sub-standard pesticides are taking a toll on the cotton crop of farmers, already bearing the brunt of drought-like conditions prevailing in the region. One such instance is of a small farmer of Nangal village, Mr Kewal Singh, whose cotton crop spread over three acres was destroyed after he sprayed a sub-standard pesticide on it. The Pesticide and fertiliser dealers of this town today observed a strike to protest against the harassment meted out to them by officials of the state Agriculture Department. At least 286 cases of encroachment on government land are pending with the local courts, out of which a maximum number of 44 cases have been filed by the Forest Department while stating this, Mr Ranjit Singh, Deputy Commissioner, said the heads concerned of various departments had been instructed to pursue these cases in the judicial courts. The Director (Local Government) has directed Pathankot Municipal Council to stop the flow of sewage towards the Air Force station here. He has directed the municipal council authorities to construct sedimentation tanks and install meshes within three months to stop the flow of sewage towards the Air Force Station. The District Magistrate today ordered the removal of hoardings and display boards in the vicinity of the Golden Temple. In a press note issued here today, the District Magistrate, Mr Raminder Singh said the order had been passed under Section 144, CrPC, for the preparations of the installation of 400th year of Guru Granth Sahib from August 28 to September 1. The cantonment police today booked two agents who allegedly duped some residents by demanding Rs 8 lakh for sending them abroad. Two local residents were crushed to death by a mini-truck near Gurdwara Nanaksar opposite the New Grain Market last night. District Education Officer (Primary), Mansa, Palwinder Singh, was caught red-handed today by a team of Vigilance Bureau while he was accepting bribe of Rs 2000 from Mr Nachhattar Singh, for transferring his niece Jagdishpal Kaur, a teacher, from a school located in Khiali Chailanwali to some other school. A resident of Preet Nagar here, Ajmer Singh, was murdered last night. Sources said that the deceased’s nephew was married to the accused, Anokh Singh’s daughter, while his niece was married to Anokh’s son, Mangi. Both families were involved in some dispute due to which both girls had returned to their homes. Students of Khalsa College here went on an indefinite strike today in protest against the alleged beating up of a student, Jaspal Singh, of the college by security guards of the institution. The students demanded the withdrawal of police guards from the college complex and to hold an inquiry into the alleged beating up of the student. 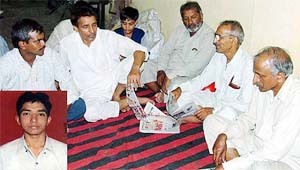 ABOHAR: Mukesh Chawla, a student of D.A.V. College here, has topped the CMC entrance test for admission to medical colleges. Earlier he had topped the state PMT and Plus 2 (Medical) examination of the Punjab School Education Board . The Consumer Forum has asked Dashmesh Dental College to refund fee of Rs 26,000 to a BDS student along with 9 per cent interest on the same and Rs 500 as expenses borne by the complainant in the case. The Department of Correspondence Courses, Punjabi University, organised a two-day seminar on “Emerging issues and problems in the North-West region of India under the new economic policy regime” in collaboration with the ICSSR, Chandigarh, at the campus here today.